Responsive Display Ads are Google’s new default ad format for Google’s Display Network powered by Google’s machine learning technology to test multiple inputs by advertisers and then optimize for the best-performing combination to display to an audience. How Do Responsive Display Ads Perform? The click-through rates for Responsive Ads are much better as compared to others. Many companies don’t have the ability to handle the hassle of standard banner ads; post-production testing required with them. Responsive Ads offer the freedom to fill up every space on the Display Network. They achieve this by filling one of the many combinations possible including Native, Text, and Banner ad space. Google optimizes these ads to custom fit the users through these steps. Images will be scaled to fit into each ad unit. Text combinations will be chosen based on available space. Some text will be truncated in limited areas. Here are a few points that shall help you while using Responsive Ads. Responsive Ads offer to attach a couple of images in landscape and square formats but the real problem arises when Google optimizes these images to custom fit several times and in several ways. Your image might get scaled down hence it’s advisable to choose an image accordingly. It’s always advisable to consider how scaling down might affect your picture before putting it up for a Responsive Ad. Another important part is dealing with logos which are essentially the same as the image components. It’s important to not be stuck to the original orientation and size of the logo but to improvise with things like cropping, or using only some part of it to make it look better when it gets scaled down, and similar things but not compromising with the essence of it. We have to consider every size as required and not optional. This will help our ad to have the best possible representation in any space they are made to fill ( As per inventory) hence maximizing the performance of our ad. If all else fails, use the same image, but utilize the crop tool that allows you to make a landscape image square or vice versa. Responsive display ads automatically optimize the size and the format to custom fit the situation several times, meaning that your responsive display ad can display as a text ad within a mobile app while also appearing as a banner ad on a website. Automatically adjusting size and format means these ads have greater reach and more click-through rates. This also means that the same image may seem fine on a desktop display but, when cropped for mobile display, it might not be what we wanted to share with the audience. With Responsive Ads, it’s always advised to adjust the images to fit multiple sizes and orientations without losing the essence of it. Descriptions Can extend the message in Headlines. Descriptions won’t be shown without headlines, so headlines can have a catchy/ Attention grabbing line and Description can have it’s explanation/ Complementing phrase. Both Headline and Description may get truncated if they don’t fit the space. The text fields while optimization and fitting according to the user might get truncated at the end, hence it would be advised to front-load messages, i.e. to ensure that the important part of our message headline stays in front(beginning) rather than the back where it might possibly get truncated. It’s always advisable to know what our ad might look like before it actually goes live. Responsive Ads contain thousands of combinations, but we have the chance to preview a few of these “ads might look like” with previews. During the build process, there are a series of sections that will show us what our ads might look like in the wild, mostly limited to square versions and one mobile-friendly view. The best time to view the potential final products is actually after the ad has been created. When in the Google Ads interface, we can click on the ad itself, and it will bring up a Preview box. Within that box, there’s a link. Use the link to preview the ad. This link opens up a whole new window with many more previews of the potential ad combinations for Native, Image, and Text placement. The link can be shared with others to gain valuable feedback and make changes accordingly. To know the performance of each of the assets (headlines, descriptions, images, etc.) 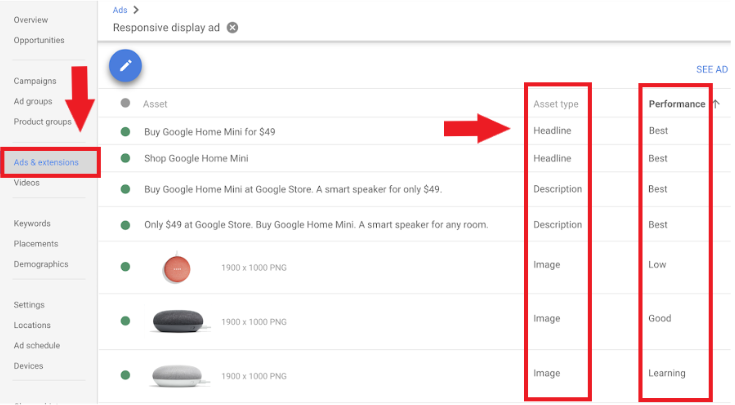 we can view that data within the asset report in Google ads. Responsive Display Ads can be attached in feed for re-marketing campaigns and be displayed in dynamic or static formats. With Responsive Ads, a lot of aspects go in the hands of Google which isn’t OK with a lot of companies. Many companies want total control of their ads right from the beginning to the end. The regulation also restricts companies in the advertising markets hence Responsive Ads are not the best option for them. It’s better to limit the use of Responsive Ads in such cases rather than compromise on the advertising.